The Poison Light Up Sign will light the way to the adult beverage area at your next party. Free-standing sign features a black frame with a clear insert and the word "Poison" in a decorative script. A little skull replaces the "O" for a fun look. When on, the sign illuminates with a white light, making the word Poison easily seen from across a room. On/off button. Uses 3, 1.5V AA-R6 batteries, included. 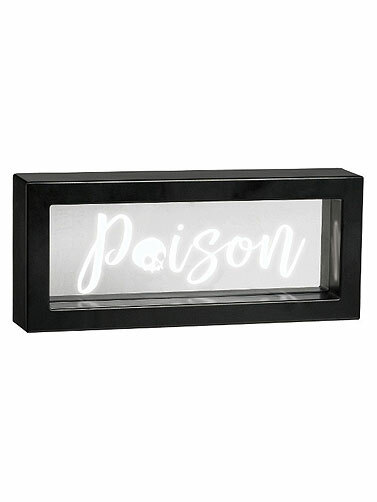 Poison Light Up Sign measures 4.75"H x 11"W.